Personal appeal to Tommy Robinson: throw off shackles of Zionist ‘advisors’ & come get nicked with me opposing Islamism AND neo-con wars. We will defy anti-English Met. 1st step: Meet at permitted demo site. Marching to Cenotaph so maximum respect in dress & actions please. Muslim Hate Preachers Out! Join our protest. Old Palace Yard, SW1. 1pm prompt this Saturday. Smart dress & dignity to honour the Fallen. Police just told me they have now banned UAF march in Woolwich. Very pleased sense has prevailed there. Streets safer for it. Yesterday some of our activists attended an open community meeting at Lewisham Islamic Centre. Representatives from the Centre, UAF, local faith and interfaith groups attended as did local students and politicians. It was agreed that there needed to be at least two demonstrations that would be stewarded and coordinated for mutual aid and support. UAF will be mobilising for their demonstration at General Gordon SquareÂ in Woolwich on Saturday midday, details are here. We have created a public Facebook event for this rally. Please come along. We are building the Lewisham rally with Lewisham Division of National Union of Teachers and Lewisham Trade Union Council. Weyman Bennett from UAF suggested that activists should attend the Woolwich demonstration first and then go to Lewisham Islamic Centre afterwards for 2pm. We strongly oppose this, we believe it is potentially dangerous for activists to take public transport between the two locations as fascists will be doing the same. We want to avoid activists having to physicallyÂ confront small groups of drunken fascists unprepared on public transport. So to clarify we believe it isÂ more important for activists to choose which demonstration they will go to. We will be primarily supporting the Lewisham Islamic Centre rally and will start assembling from 1pm but we will be in touch with UAF activists throughout the day. The Police will decide if they will ban a moving British National Party demonstration/motorcade tomorrow evening. It is unclear if this will happen and even if they do, the British National Party will still gather somewhere in South London. We do not believe that the far-right will abide by a state ban and so we will prepare for some mobile activity. 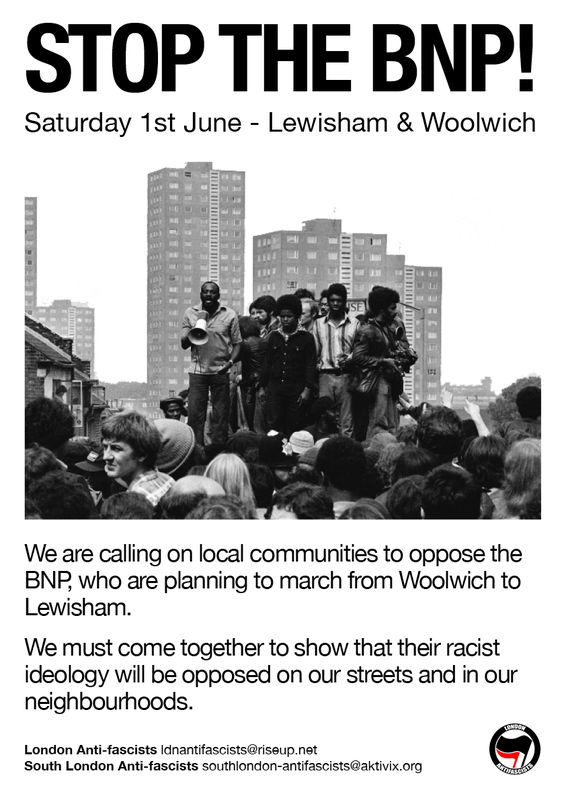 We will be leafleting the local area in Lewisham and we are aware of other actions that cannot be made public that will attempt to stop the BNP where-ever they gather in South London. We will publicising this poster which you can download, print off and distribute.